The Parachute Cargo Bag from 5ive Star Gear is a general-purpose option for transporting equipment with enough interior space to carry an impressive amount of gear. 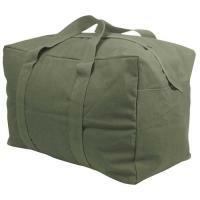 Made from ruggedized, heavy-duty cotton canvas, the bag guarantees high levels of load-bearing strength and wear-resistance. The full-length zipper securely retains contents, while a snap-fastened storm flap serves to prevent water intrusion that can damage items. Full wrap-around carry handles are reinforced for added durability and comfortable carry, while a pair of attached D-rings allow for use with a personal shoulder strap.